The joystick can be moved and placed to the left, right or on the backrest * if the user can not operate the joystick by him self. The footrest can be folded up for easy entry and exit. Removable cushion with removable case which can be washed in the machine. The armrests can be folded up for easy entry and exit. Smart tilt protection with gas allows driving over curbs and steps (L & L-Plus). Twin brushless motors of the latest technology provides range of 30 km. Adjustable backrest that can be slack with adjustable velcro (L & L-Plus). Large bag under the seat for personal belongings. Dual 24-volt lithium batteries of the latest technology, combines low weight with high power. 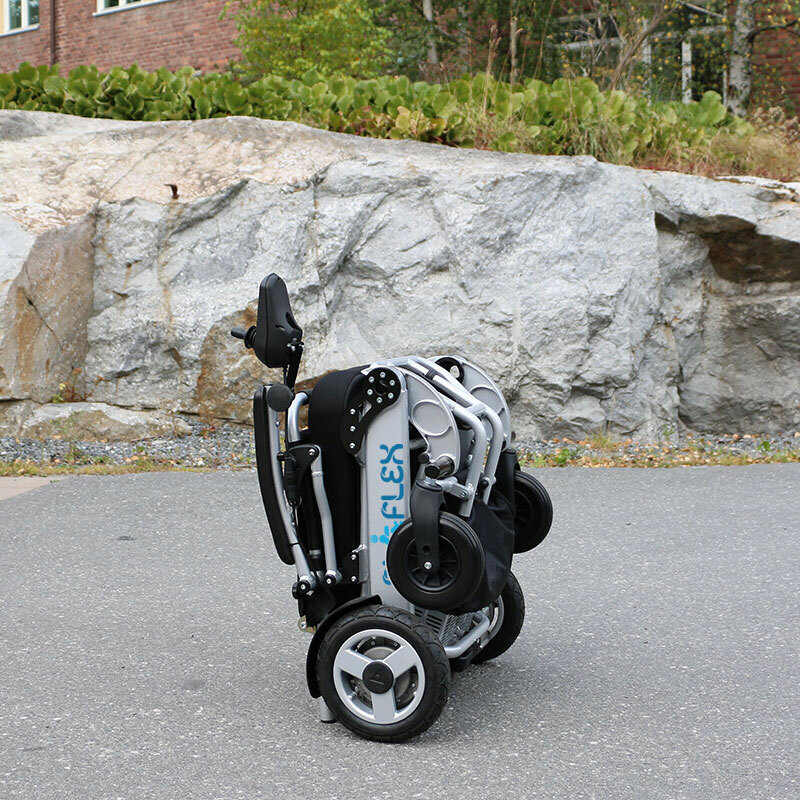 Eloflex is a completely new type of electric wheelchair that’s never been seen before. It is packed with a host of smart technology and unique features make it the most useful and versatile powered wheelchair on the market. Every Eloflex wheelchair is a small wonder in itself – a special combination of advanced engineering, new technology and smart materials designed to give you optimal mobility and freedom. All chairs are built on a lightweight and robust aluminum frames. The precision is high, resulting in superior stability and ride comfort. The clever folding design makes the chair extra user-friendly and flexible, while the compact build ensures that you can get around as easily as with a manual wheelchair. Thanks to its high-quality, lightweight aluminum frame, Eloflex weighs only 26 kg, including the battery. This should be compared with a “normal” powered wheelchair that weighs between 80-150 kg. Due to its low weight, Eloflex is easy to transport by car or flight. The low weight also means that the driving range can be extended and that the chair is more responsive. Eloflex is collapsible in one seamless motion. Like with a baby stroller, you can transform chair into the size of an ordinary suitcase in just seconds. This advantage, combined with its low weight, makes it easy to lift into the car, store in the closet or to check in at the airport. Eloflex can also be rolled when folded, making it extremely easy to move. Eloflex is designed, engineered and manufactured using state-of-the-art technology. Its highly efficient lithium ion batteries are far superior to the old lead batteries, both in terms of performance and lower weight. The powerful brushless and gearless direct drive motors are mounted directly on each wheel, making them both quieter and more efficient than the bulky motors used in traditional wheelchairs. 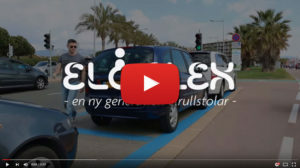 Together, the new technology allows Eloflex to roll more than 30 km on a single charge. The smart and flexible design provides many benefits. Thanks to the compact dimensions, rear wheel drive and the same performance as a manual wheelchair is obtain outstanding performance. The turning radius is small, high precision and the possibility to navigate inside a shops, restaurants or cafe, and be able to enter the toilet is just as good as with a manual wheelchair. The clever design allows you to fold your Eloflex in seconds. With a simple operation, you collapse your Electric in the same manner as a stroller. This power wheelchair is aimed to all users. Active wheelchair users seeking an additional smooth power wheelchair. Older people who want the freedom to move themselves. Weaker wheelchair users who can not operate a manual wheelchair. Perfect to load in the car, take to work, on the go or when visiting friends and family in another part of the country. Eloflex will become a part of your active life. Eloflex is freedom on wheels. The pad does not need to be removed when the chair is folded. Easy and convenient. A smart support allows the chair to stand by itself in an upright position when folded. The chair can be rolled on the rear wheels when it is folded. The joystick is easily removed if the seat will be checked in on a flight. * Attendant Control requires holder sold as an accessory. 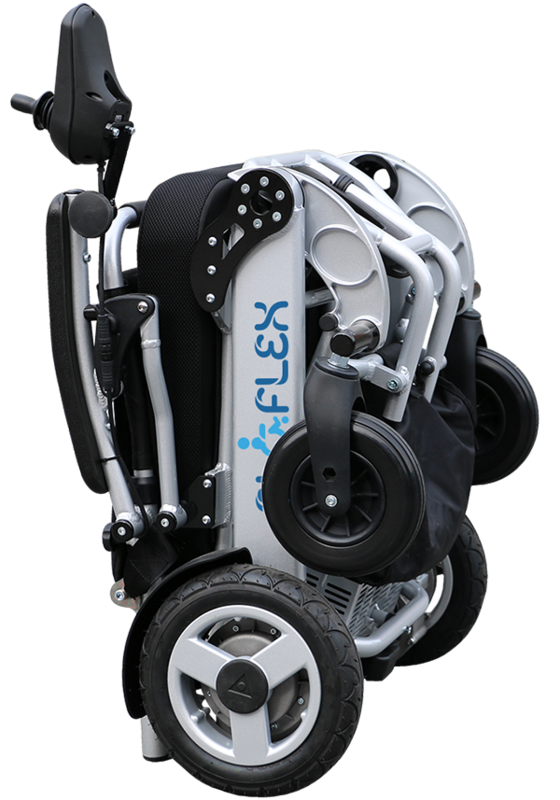 Eloflex is a folding power wheelchair that is different from traditional wheelchairs and permobils. Watch our films so you can understand what makes Eloflex a unique wheelchair.